The Web’s birthday provides an occasion to take stock of the impact of the rapid growth of the internet since its invention and the attendant rise of mobile connectivity. Since 1995, the Pew Research Center has documented this explosive adoption of the internet and its wide-ranging impacts on everything from: the way people get, share, and create news; the way they take care of their health; the way they perform their jobs; the way they learn; the nature of their political activity; their interactions with government; the style and scope of their communications with friends and family; and the way they organize in communities. Adoption: 87% of American adults now use the internet, with near-saturation usage among those living in households earning $75,000 or more (99%), young adults ages 18-29 (97%), and those with college degrees (97%). Fully 68% of adults connect to the internet with mobile devices like smartphones or tablet computers. The adoption of related technologies has also been extraordinary: Over the course of Pew Research Center polling, adult ownership of cell phones has risen from 53% in our first survey in 2000 to 90% now. Ownership of smartphones has grown from 35% when we first asked in 2011 to 58% now. 90% of internet users say the internet has been a good thing for them personally and only 6% say it has been a bad thing, while 3% volunteer that it has been some of both. 76% of internet users say the internet has been a good thing for society, while 15% say it has been a bad thing and 8% say it has been equally good and bad. 53% of internet users say the internet would be, at minimum, “very hard” to give up, compared with 38% in 2006. 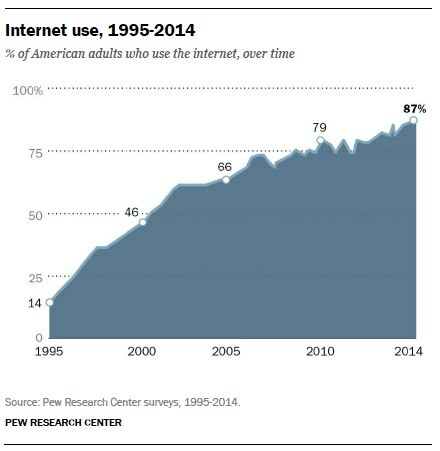 That amounts to 46% of all adults who now say the internet would be very hard to give up. 49% of cell phone owners say the same thing about their cell, up from to 43% in 2006. 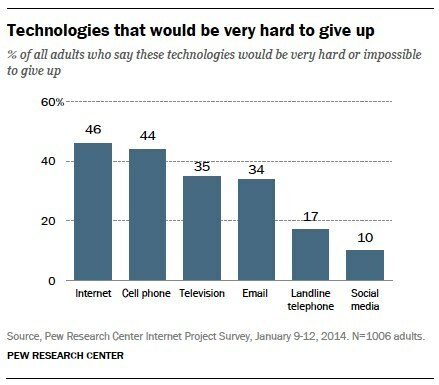 That amounts to 44% of all adults who now say cell phones would be very hard to give up. Overall, 35% of all adults say their television would be very hard to give up, a share that has dipped from 44% who said that in 2006. 28% of landline telephone owners say their phone would be very hard to give up, a major drop from 2006 when 48% of landline owners said it would be very hard to give up their wired phone. That amounts to 17% of all adults who now say their landline phones would be very hard to give up. In addition to this enthusiasm, a notable share of Americans say the internet is essential to them. Among those internet users who said it would be very hard to give up net access, most (61% of this group) said being online was essential for job-related or other reasons. Translated to the whole population, about four in ten adults (39%) feel they absolutely need to have internet access. Among those most deeply tied to the internet, about half as many (some 30%) said it would be hard to give up access because they simply enjoy being online. There is considerable debate about whether online communication—through email, messaging, or social media—has strengthened or weakened relationships. Internet users’ own verdict is overwhelmingly positive when it comes to their own ties to family and friends: 67% of internet users say their online communication with family and friends has generally strengthened those relationships, while 18% say it generally weakens those relationships. Interestingly enough, there are no significant demographic differences tied to users’ feelings about the impact of online communication on relationships. Equal proportions of online men and women, young and old, rich and poor, highly educated and less-well educated, veterans and relative newbies say by 3-to-1 or better that online communication is a relationship enhancer, rather than a relationship detractor. Asked for a broad perspective about the civility or incivility they have either witnessed or encountered during their online tenure, 76% of internet users said the people they witnessed or encountered online were mostly kind and 13% said people were mostly unkind. People were also considerably more likely to say they themselves had been treated kindly than they had been treated unkindly or attacked. And internet users were more likely to say online group behavior they had seen had been helpful, rather than harmful. 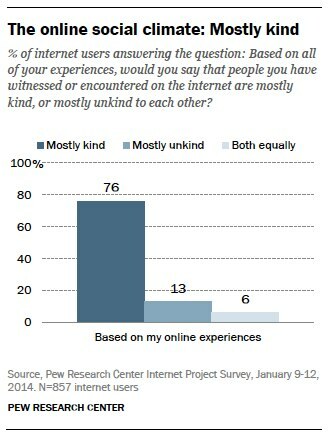 70% of internet users say they had been treated kindly or generously by others online. That compares with 25% who say they have been treated unkindly or been attacked. 56% of internet users say they have seen an online group come together to help a person or a community solve a problem. That compares with 25% who say they have left an online group because the interaction became too heated or members were unpleasant to one another. The results in this report are based on data from telephone interviews conducted by Princeton Survey Research Associates International from January 9-12, 2014, among a sample of 1,006 adults, age 18 and older. Telephone interviews were conducted in English and Spanish by landline and cell phone. For results based on the total sample, one can say with 95% confidence that the error attributable to sampling is plus or minus 3.5 percentage points. For results based on internet users (N=857), the margin of sampling error is plus or minus 3.9 percentage points.